Do you ever wish you could hire a personal stylist, have someone help guide you when it comes to styles you know you like? Do you loathe clothes shopping because you get overwhelmed and frustrated by all the choices? Do you put it on the back burner because you just don't have time? If you said yes to any of these questions I have a fun and affordable solution for you. I'm so excited to share a fun and easy way to shop. It's called Golden Tote. If you haven't heard of Golden Tote I'll explain. It's an online site where you have the option of choosing between 2 different levels of service. You can select the 2-3 item tote for $49 (a $200 value) or 5-7 item tote for $149 (up to $600 value). Does this spark your interest? If so, you can begin by going to Golden Tote and fill out your style profile, select 1-2 of your favorite pieces and the rest of the items are chosen for you, selected by a stylist, based on your preferences. I had the pleasure of trying out their service and couldn't wait to share what I chose and what my surprises were. To be honest, I was a little hesitant on the surprise portion. I am not a big fan of people picking out clothes based on what they "think" I would like, but was I beyond pleased by how well they matched my style. The quality of everything was superb. Plus, they sent idea cards for styling some of the pieces. I have always been skeptical of these types of services and actually enjoy shopping for myself, but I must say, this was so easy and fun. I picked a few pieces I knew I would love, got a few surprises along the way, received a box full of goodies on my door step and didn't even leave my house. Score! I do want to mention that this is NOT a monthly subscription. You can try it out once, if you like it you can come back next month, every other month, once a quarter or even send as a gift to someone else. I put together five styles of the six pieces I received. 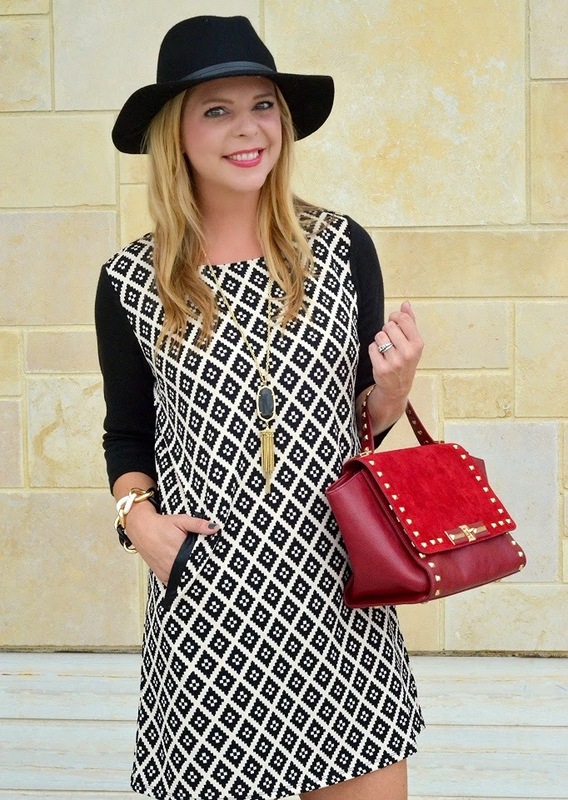 As you know, my style is eclectic, so I had fun playing with five totally different looks. I hope that you see at least one you can relate to. If you want to give Golden Tote a whirl, you can sign up here. I highly recommend it and hope you all know that I never share companies or products that I don't 100% believe in or have not have tried for myself. P.S. In case you are worried about receiving an item that doesn't suit your style preference, there is a Golden Tote trading group on Facebook where you can exchange pieces from your tote. Thank you Golden Tote for partnering on this post. As always, all opinions and thoughts are 100% my own. Also, a HUGE thank you to Melanie Wright Photography. very interesting servite, i going to try it! awesome service, love all these looks. If you get the chance, join my linkup today to share your amazing post. I love that all of these looks are so different, great job styling! 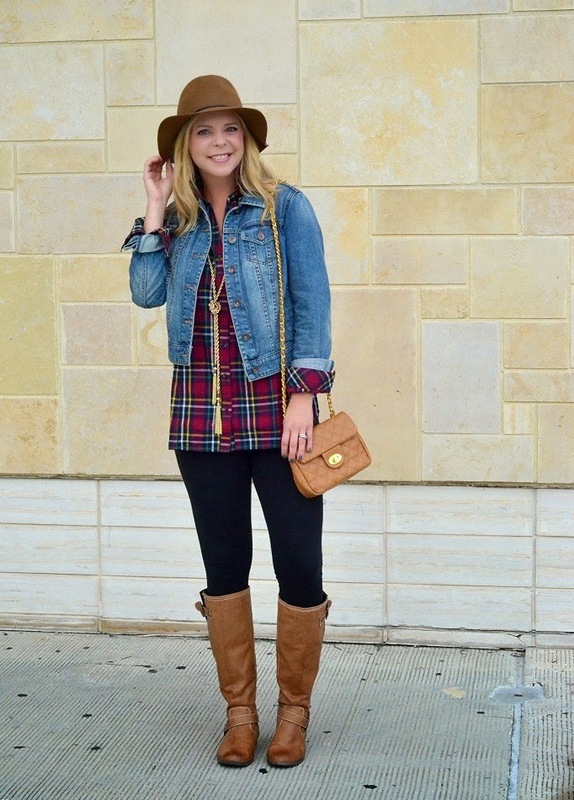 So cute - that last outfit is my favorite...love seeing how you styled all the pieces! 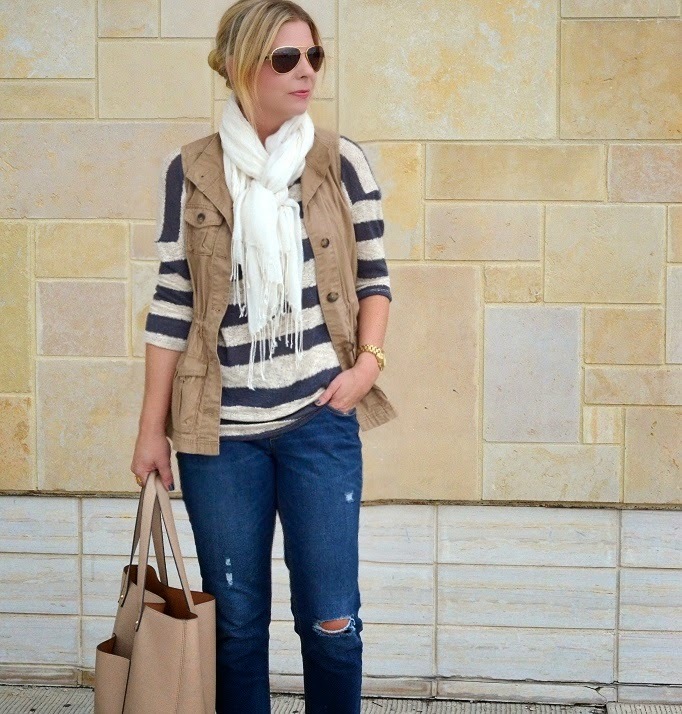 Thinking about adding a military vest to my closet! The one you are wearing is so cute! Love that plaid shirt! Been looking for a good one for this season! LOVE! 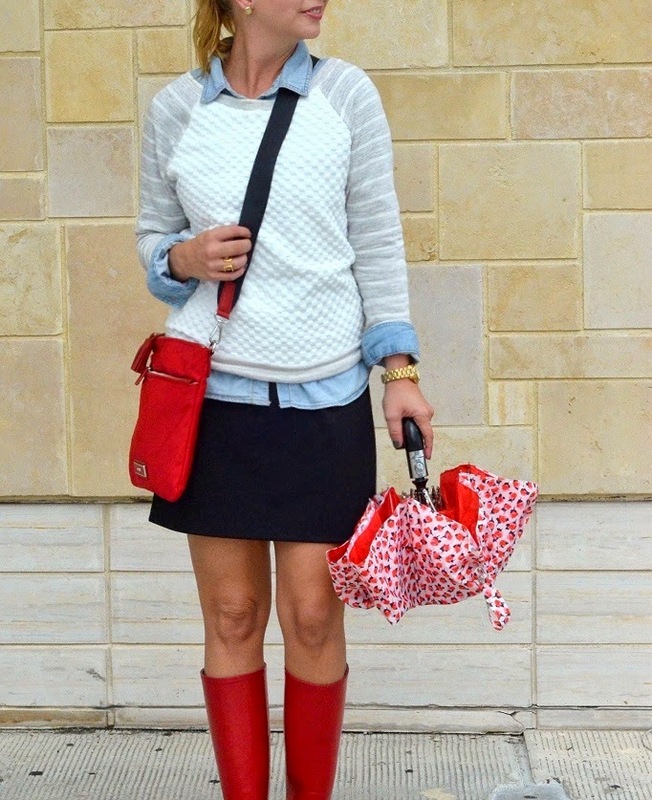 That sweatshirt is adorable and you're teasing me with those totally cute red boots...I want to whip mine out already! You know I LOVE Golden Tote. The way I look at it...I pay the price I am willing to pay for a piece I REALLY want and anything extra (surprises) are just the gravy on top! Great job styling so many different looks. Loved this post! Loving that last dress, such a perfect, easy shift! I love that sweatshirt with the striped sleeves! So cute, and I love how you styled it. The dress is really pretty too. Out of curiosity, which items did you pick for yourself and which were the surprises? I always love fun surprises! I registered a while ago but I have yet to press the order button. You got some great pieces though. I am just loving all of these outfits. 3 and 4 are my faves. You look so cute in these! What an awesome service! I have friends who use this or Stitch, but I just love shopping so I don't want to hand it over to someone else haha! I love number 3! Oh that 4th outfit I'm OBSESSED with! Soo cute, as usual!!! I love that sweatshirt, and that dress with the little detailing in the pockets, it seems like a very good service. You look great in all the outfits. Very cute. AH! I love those pants and so many cute outfits here Shanna! LOVE! OMG! I totally love every single piece they sent you and I love every single one of these outfits! You are gorgeous and oh so stylish! All of these looks are gorgeous! I especially love the one with the red rain boots. So cute! I love all the stuff you got!!! I've been wanting to try Golden Tote so badly! Thanks so much for sharing! I love the plaid top that was picked out for you! I haven't heard of Golden Tote before, but can't wait to give them a try! This is a service I've been wanting to try for a while. The only thing that was holding me back is that I'm not able to return what I don't like. I wasn't aware about the fb game that your able to trade with other people. I would deff give it a try now. Not a fan of the sweatpants (i just don't get that trend this year) but everything else is fantastic! How fun! 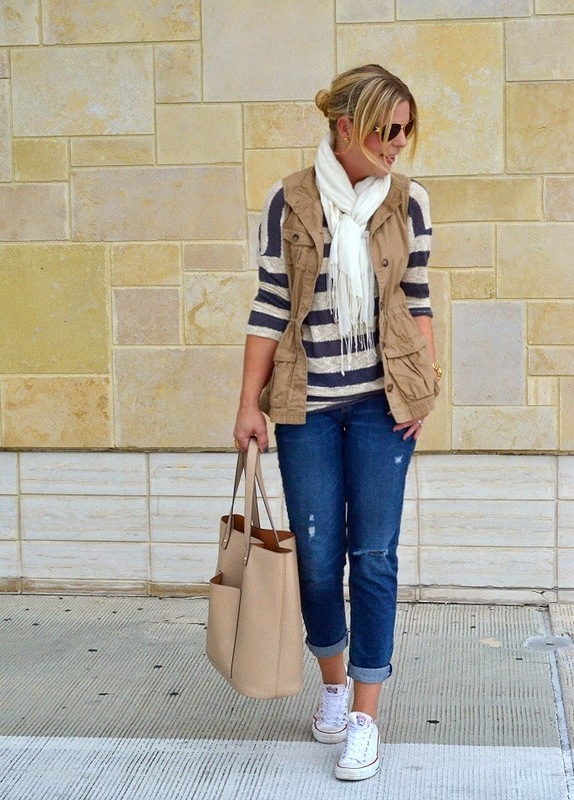 I love the look with the vest the best. I may consider this. I'll have to check out their sizing options.